Christine and I have just returned from a month in Japan. We used our JR Passes heavily, bouncing between Honshu, Shikoku and Kyushu, squeezing in extra day trips when something new struck our fancy. There was always something interesting to look at, and plenty to stimulate our brains. We took over 1000 photos and made 100 pages of notes. My plan is to put turn these notes into a series of themed blog posts complete with drawings. I’m going to do that over the next few months, with all the posts tagged with the keywords “Japan Trip 2016”. Just to give you a teaser of what we got up to in Japan, here is a “photo a day” from our trip. Enjoy, and check back regularly for updates! Our Tokyo friends Yas and Eigo helped us get acclimatized on our first jet-lagged night. Here they are selecting skewers for us at a yakitori (drinking and snack bar). 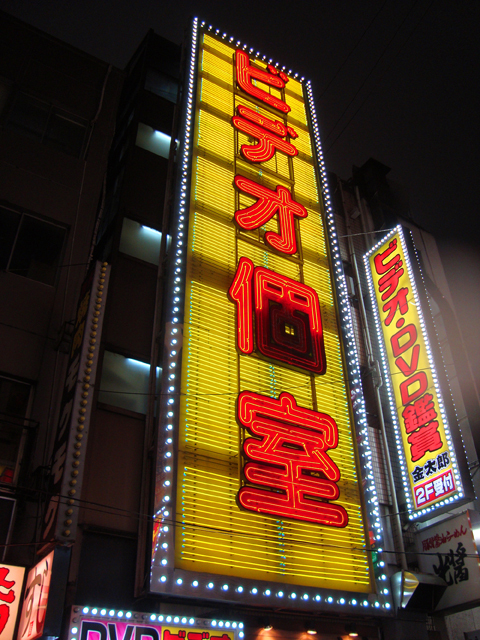 Neon is disappearing in Japan, being replaced by cheaper and more malleable LED. The tourist guide-staple intersections in Shibuya and Shinjuku look just like Toronto’s Dundas Square nowadays, but you can still find the warm and crackly good stuff in older neighbourhoods. 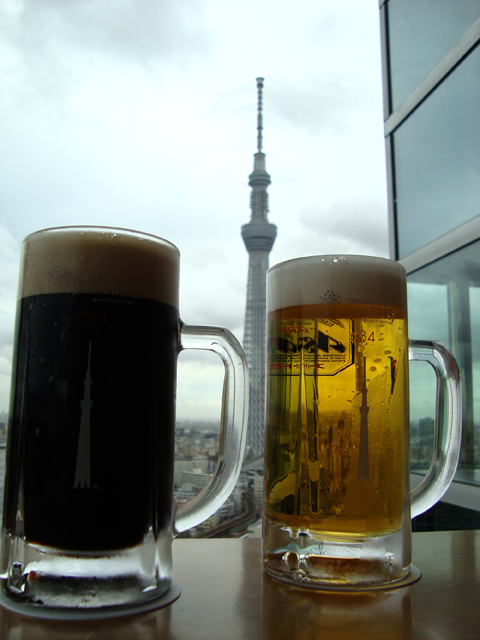 We grabbed a couple of pints on the observation deck of the Asahi Super Dry corporate headquarters. A great spot to survey the sprawling city and the nearby Tokyo Skytree. They grow them big in Japan. 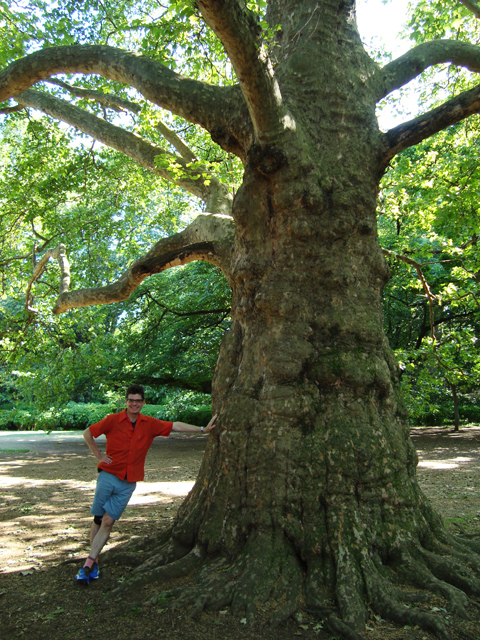 We regularly came across enormous and ancient trees on our travels through the green archipelago. 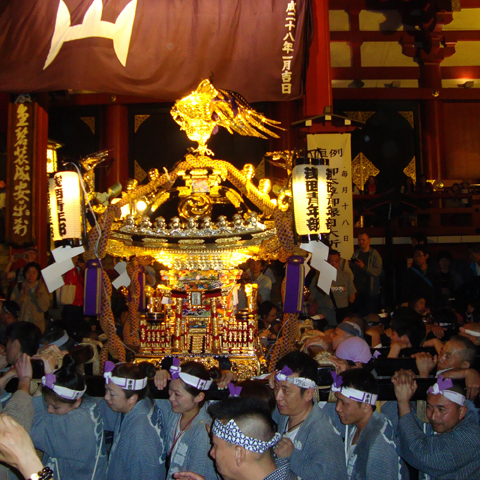 The Friday night dress rehearsal for the Sanja Festival in the Tokyo neighbourhood Asakusa. We got to see the parade of shrines, hear the drumming and shouting, but without the million person crowd expected for Saturday. 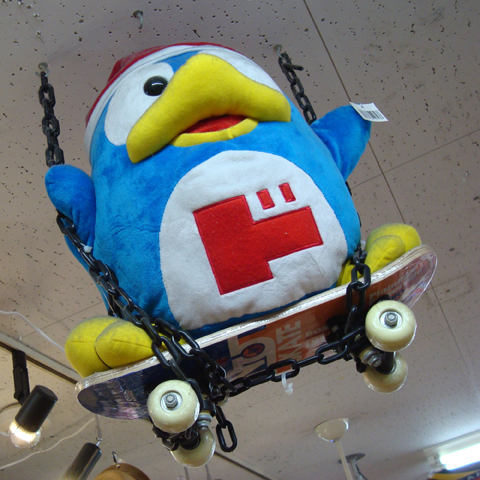 We got a little crazy about discount store Don Quijote and its penguin mascot. Imagine Toronto’s Honest Ed’s or Vancouver’s Army & Navy store with a lot more pre-recorded jingles plus massive snack and costume departments. Kyoto is as lovely as everyone says it is. 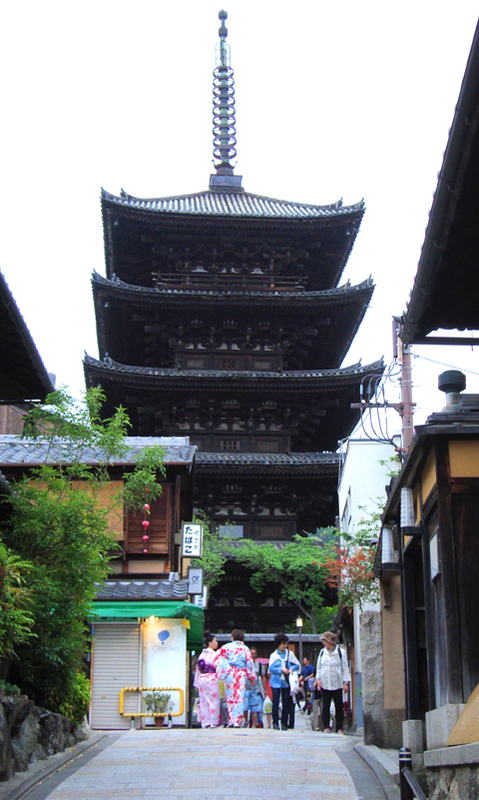 Beautiful wooden shrines, ancient streets and kimonos everywhere. 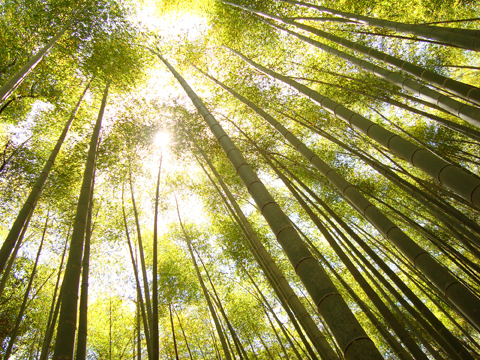 The Arashiyama bamboo grove near Kyoto is a breathtaking sight, and situated near a couple of other fine landscape gardens. 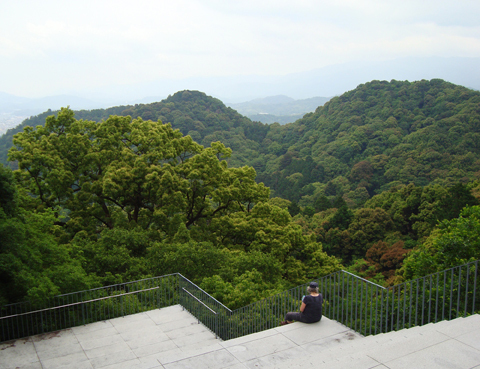 One garden surrounds the Tenryugi Temple, the other is the former villa of film star Okochi Denjiro. It pays to get out of bed early if you want the experience these places in an unhurried fashion. All the main Arashiyama sites were mugged by tour busses and school children by 10:30 a.m. 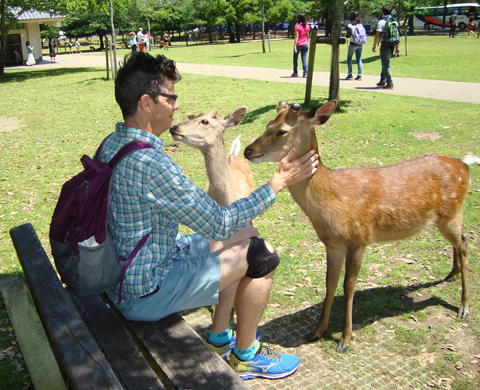 The deer in the temple town of Nara will eat right out your hand, and elderly vendors are set up along the road to sell you bundles of “deer crackers”. 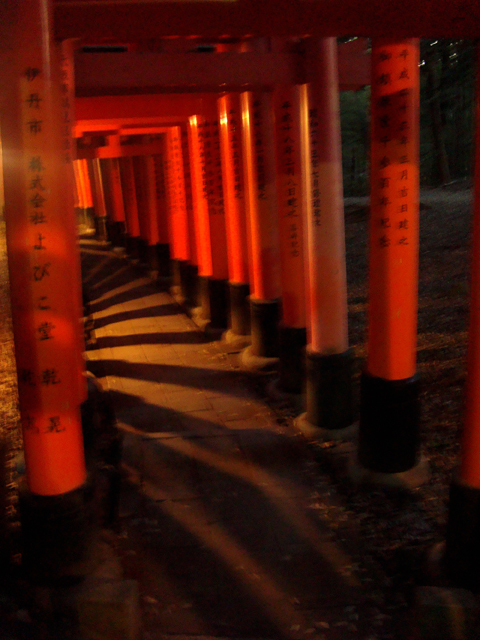 We hiked up to the top of Mount Inari, under thousands of red tori gates. We started late in the day and had to make our way back in the dark, which was both eerie and wonderful. 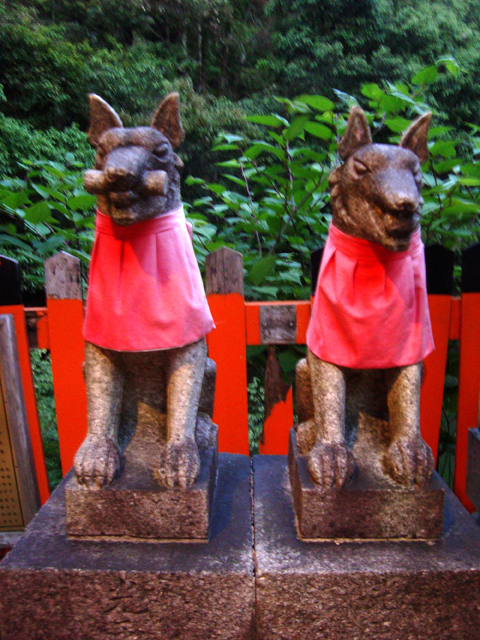 Mount Inari’s Shinto gods are a pair of white foxes. These statues are everywhere on the mountain, some at tiny shrines and others poised as gate guardians. 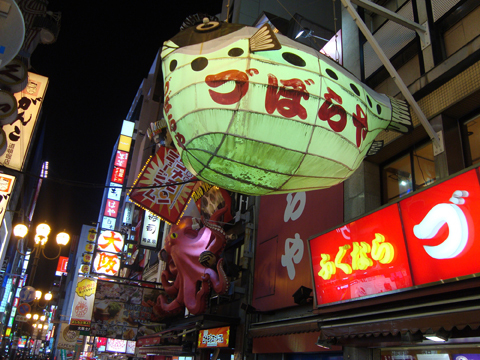 Osaka’s Dotonbori is like a carnival of eating. We ate okonomiyaki (cabbage pancake thing), takoyaki (octopus balls), melon bread stuffed with ice cream, and some things on sticks. 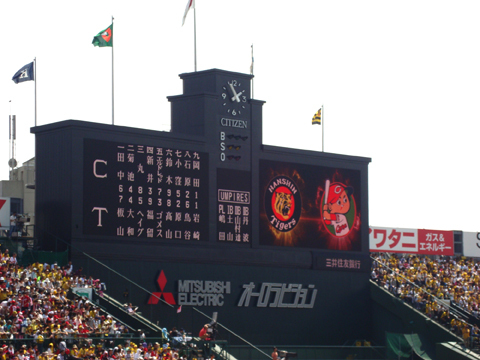 The Hanshin Tigers played a tight game against the Hiroshima Carp at Koshien Stadium. A great no-frills place to see a baseball game: singing fans, delicious food, and excellent sight lines. Bob Bavasi’s JapanBall hooked me up with the tickets before we left for Japan and delivered them to our hotel. Great service! The Osaka Aquarium has a unique design: The sea life is in huge tanks, and museum goers walk down a descending ramp to view the animals at different angles and levels. 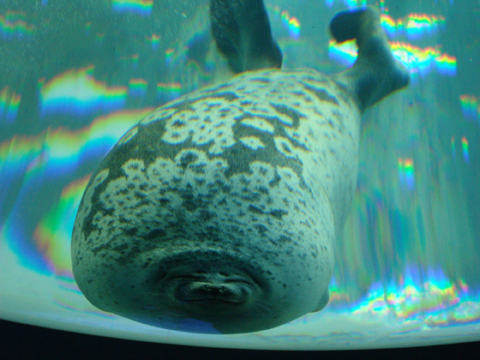 This seal is looking through a bubble window at the bottom of its tank. 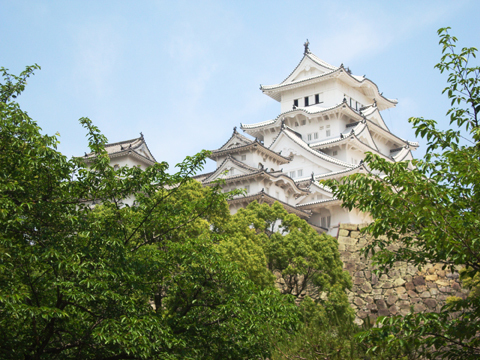 Himeji Castle, also known as the White Heron Castle, is an amazing fortress dating back to late 1500s. Lovely to look at, but deadly to attack. 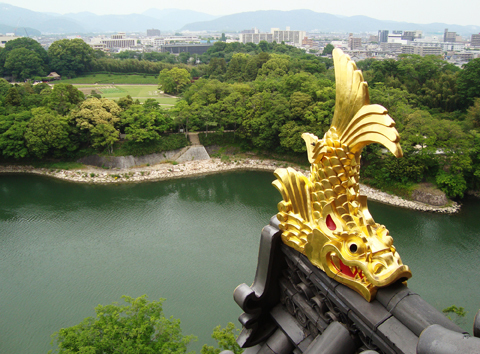 The fish is a common roof feature on Japanese castles, meant to ward off fire. In the case of Okayama Castle, the fish didn’t work and the building is a concrete reproduction. 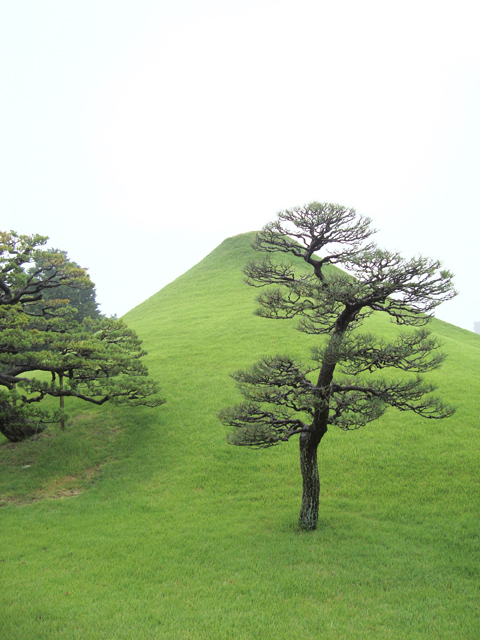 Below is Korakuen Garden, said to be one of the best landscape gardens in Japan. When we realized how efficient the trains are in Japan, we started adding extra day trips. 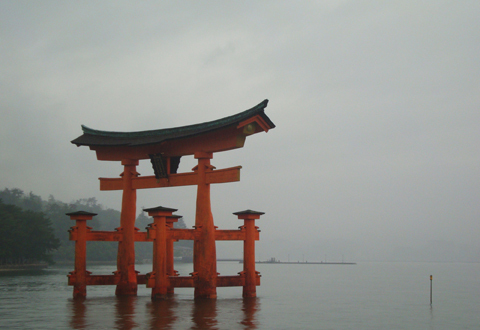 It takes two trains and ferry to get to Itsukushima Shrine from Okayama, and we still managed it in less that two hours. On our way back to Okayama, we stopped by Hiroshima for some somber thoughts and had lunch at a four story building with only okonomiyaki stalls as tenants. One has to climb 1,368 stone steps to get to the Kompirasan Temple on the island of Shikoku. You’d think that would discourage tourists and schoolchildren, but they were all over the mountain. Christine has a knack for finding a quiet place even when there’s a crowd 100 meters away. 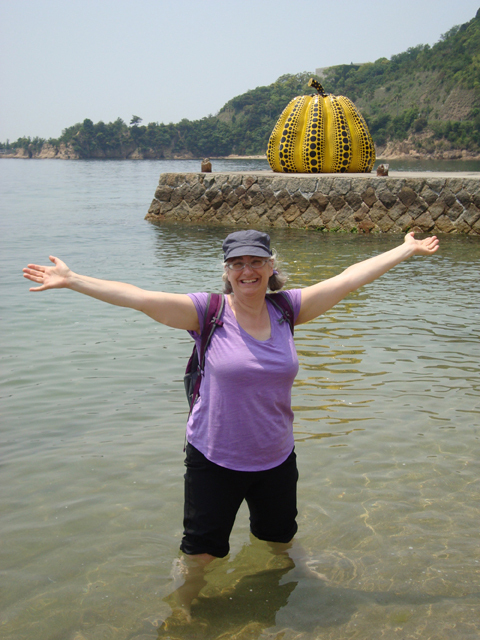 Naoshima is an odd place. It’s an island dedicated to modern art installations, housed in the polished concrete architecture of Ando Tadao, and it feels like the sort of place a James Bond villain would build. We got to put our feet in Pacific Ocean. The steep, grass covered hills and winding paths of Suizenji Garden in Kumamoto are a pleasure to stroll through on a rainy day. The garden’s pond lost much of the water after the recent earthquake, but the spring seems to have found its way back in recent weeks. We booked a tour with Explore Kumamoto before the earthquake, and decided not to cancel regardless of some roads and buildings being damaged. 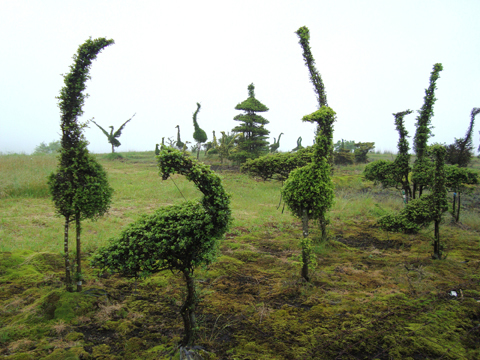 Our tour guide Helen created a new tour for us, with stops at a steam-engulfed village, a haunting shrine, and this topiary garden with figures straight out of a Francis Bacon painting. Fukuoka is famous for its outdoor food stalls, but this isn’t one of them. 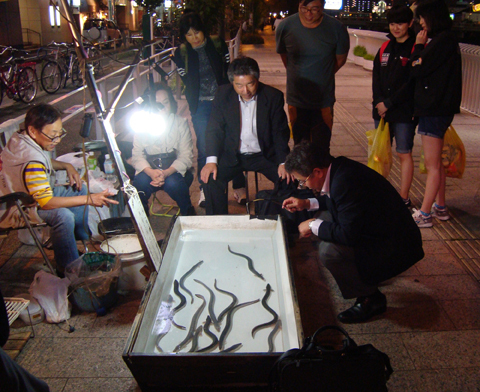 These businessmen are trying to hook eels in a crooked gambling set-up. 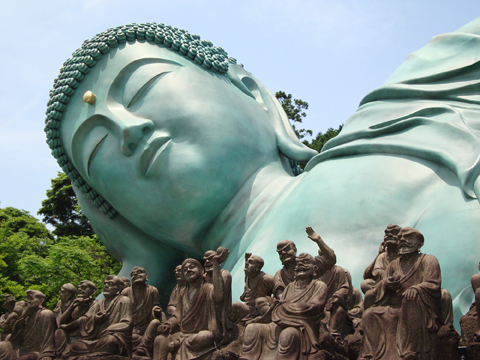 The largest reclining Buddha in Japan, or maybe the world, is at the Nanzoin Temple just outside of Fukuoka. There’s also a huge sitting Buddha in Fukuoka itself, but you can’t take photos of it. 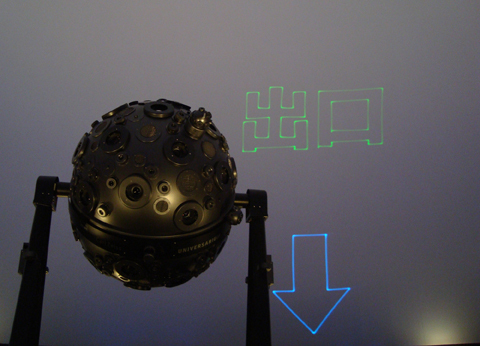 The narrator at the Nagoya Science Centre’s planetarium has the mellowest voice in the world. The presentation is 50 minutes long, the perfect amount of time for a nap, and we were surrounded by snoring. 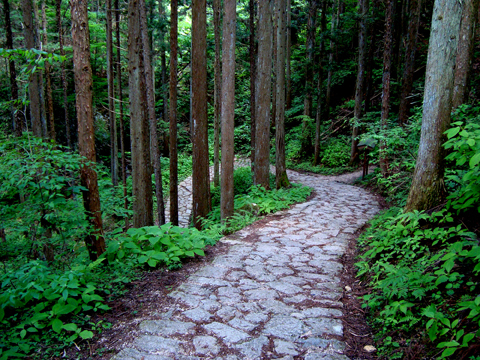 The Nakasendo Walking Trail is an eight kilometer hike between two villages, taking the old route between Kyoto and Edo (Tokyo). There are a pair of nice waterfalls and plenty of mountain views along the way. 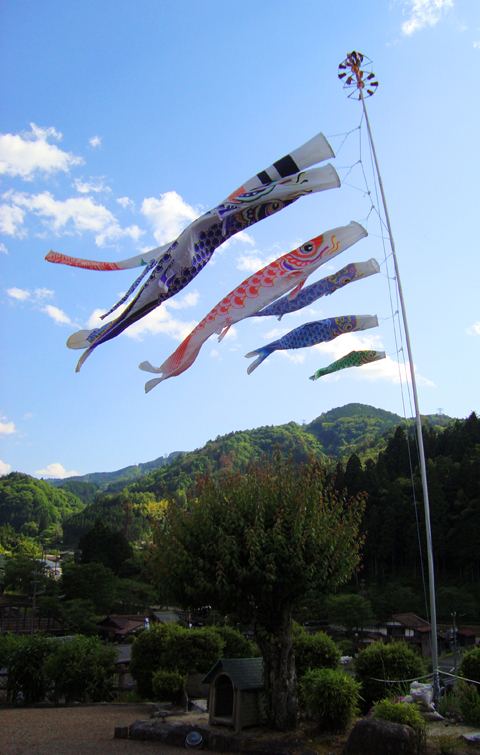 Fish flags over Tsumago, the end point of the Nakasendo trail. 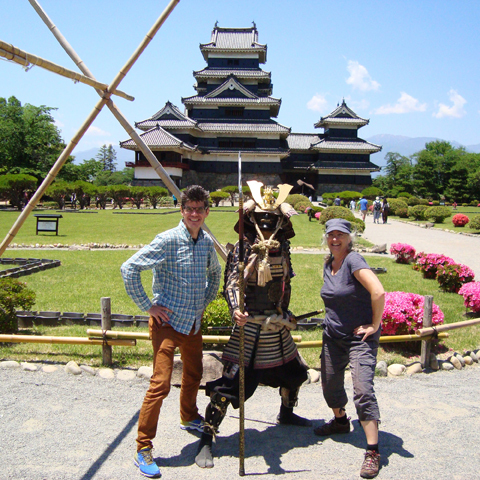 We visited Matsumoto Castle (Crow Castle) on our way back to Tokyo. Three turrets and a moon-viewing porch on this castle. We spent our last day in Tokyo visiting some museums. We always do this at the end of trip, because at that point we have absorbed some of the culture and get more out of exhibits. 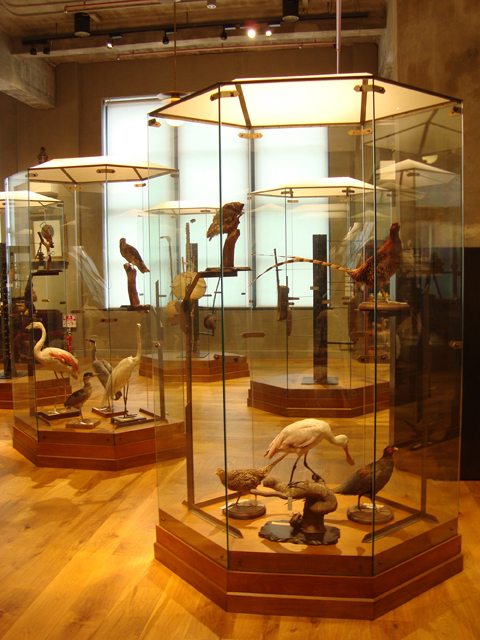 This museum is a collection of old curiosities presented in 19th century cases. We stumbled across the show when we were exploring Japan Post’s fancy shopping mall Kitte. The view from our final Tokyo hotel was of the railway tracks. 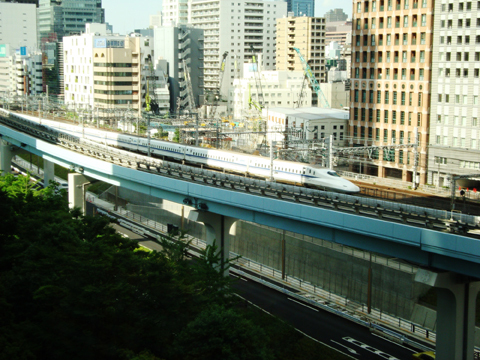 Shinkansen bullet trains, commuter rail and a monorail passed constantly, while the highway below was mostly unused. We would lie on the bed with the window open, listening to the sounds of the 21st century and vowing never to talk about Toronto transit again.